Currently Cephalerpeton is the basalmost reptile we know of, the most primitive one most likely to have laid that first amniotic egg. It nests at the base of all other reptiles and descended from a tiny Gephyrostegus watsoni (Figs. 2 and 3). The problem is Cephalerpeton was twice the size of G. watsoni. Cephalerpeton had those giant teeth, both in the premaxilla and maxilla. 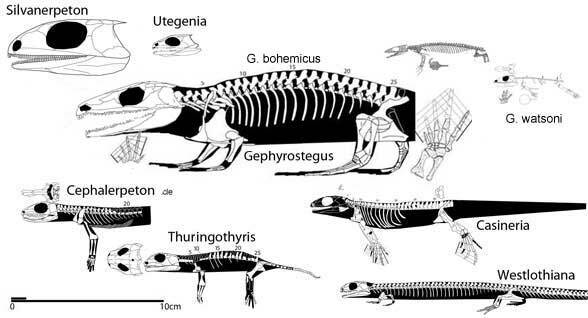 These traits had morphologically skewed Cephalerpeton toward the plant-eating side of the basal Reptilia beginning with the captorhinids and millerettids. Figure 1. Cephalerpeton, the most primitive known reptile. Even so, it is clearly derived from its proximal sister, Gephyrostegus watsoni. If you’re looking for THE most primitive reptile, look for something in between G. watsoni and Cephalerpeton in size and morphology. Plus, Cephalerpeton has a few autapomorphies, like a long robust neck and the deeply concave mandible. Then again, Cephalerpeton arrives rather late on the scene in the fossil record. The tiny Gephyrostegus watsoni (Fig. 3) is probably closer to the size expected following Carroll’s (1970) hypothesis on egg-laying. All it needs is to fuse the intermedium to the supratemporal or postorbital. Or, the intermedium may have become reduced to nothing, as it never reappears in derived taxa. Figure 2. Gephyrostegus watsoni, a tiny pre-reptile and THE sister to the Reptilia. In most respects it is a close match to Cephalerpeton and the larger, more primitive G. bohemicus. We’re looking for a twin to G. watsoni with the following changes: 1) loss of the intermedium; 2) pelvis without two dorsal processes; 3) a smaller, narrower interclavicle; 4) perhaps a taller, more ossified scapula; 5) better ossified vertebrae. If something like this is languishing unloved in some museum drawer, well, let’s bring it out! Speaking of something old, something new on Romeriscus coming soon. This entry was posted in evolution, reptile family tree, reptile origins and tagged reptile family tree, reptile origins by davidpeters1954. Bookmark the permalink. Have you ever analyzed your data through something like MrBayes instead of a parsimony algorithm? A lot of the talk I heard at SVP involving cladistics centered around these two apparently mutually exclusive ideas. Your discussion of direct line ancestors seems more in line with a Bayesian anagenesis as opposed to the traditional idea of cladogenesis. MrBayes could not open my large reptile file. If you can help, that would be great. At the moment I cannot but if I get the ability to I will let you know or pass contact info to you.